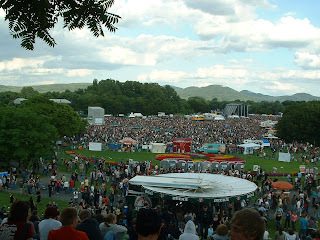 Yesterday, on my birthday, I went to the Rheinkultur music festival: one day, 5 stages, free entry. The plan was to meet some people at the Ollenhauerstr. stop of the S-bahn at 5:30pm, a few stops before Rheinaue, the festival location, and walk the rest of the way. It's a five minute ride from the Hauptbahnhof (the main train station) which is a few minute walk from my apartment. When I got the station, it was packed (average age of the crowd: 19, and in typical German fashion, they're all drinking bottles of beer) and they weren't letting people onto the platform. My friends called and I said I thought I'd be 20 minutes late. I waited for 30 minutes before I got onto a packed train. At each stop, the train would briefly stop and the people standing on the platform would look sadly at the packed train as it started again without picking up a single person. At Ollenhauerstr., the train stops briefly and no one moves and I'm 20 people away from even attempting to get off the train. I have just enough time to wave to my friends as the train starts again and takes me to the next stop. When I get there, the doors actually open and I manage to push my way off the train. I try calling: no luck. I wait for the next train: nope. I walk the few block back to Ollenhauerstr. : there's no one there. This is not promising. I'm pretty far from home and I need to use a bathroom, so I figure I might as well keep on going and see what's what. I follow some people in the vaguely right direction until I'm there. I'm at the top of a bowl, where there are a bunch of biergartens and people picnicking on the lawn. You can see that one stage is behind the trees on the left and another stage is further on the right. Between the stages are food and drink stands and off to the left is a crane that takes people up for bungee jumps. All in all, the crowd is pretty mellow -- I didn't see any people who had a few or 12 too many and I didn't smell any illegal substances. And after weeks and weeks of rain, it was clear and 70 degrees the whole day. After a visit to the port-a-potty (I chose the line with the prissiest looking girls, figuring it'd be slow but less vile) and wandering a little bit, I come to a decision. I've been to the 4th of July at the Esplanade in Boston and I've been to the Taste of Chicago and I've never totally lost everybody. 150,000 is not a problem. The easiest way to solve a math or physics is to guess the right answer. The easiest way to find 2 people in a crowd of 150,000 is to go to where they would be. It's 7:30pm and I stumble upon a guy handing out maps. I snag one. They're not biergarten or picnicking peple. And I know that at very least at 8:50pm, they're going to be at the blue stage watching Calexico. There are people sitting on the grass, while people closer to the stages are all standing. They're standing sort of people. I wander to the blue stage, close enough to get to the people standing. And there they are. They, by the way, had run from our meeting point to the Rheinaue, assuming I wouldn't be able to get off before then. We catch part of the set of Lambchop, an alt-country group from Nashville, and a little bit of Mother Tongue (at least I assume that the right link). And here's one of their videos (It's very old; don't worry, they weren't dressed like that live, and it turns out at least one of them must work out a lot). The crowd was incredible: jumping up down and singing along and packed like sardines (by the way, when you're wedged against 4 people and they're jumping up and down, you'd better be jumping up and down too). I couldn't see anything and some girl was grinding into my right hip. Air temperature was probably 60 degrees, while crowd temperature was approaching 85. Crazy. The concert was over at midnight, but all the food and drink stands were still open (guess they're not worried about drinking and driving) and all the public transportation packed. We ended up walking to one person's apartment and then he drove me most of the way home. By the time I got home at 1:30am, I'd been standing for 7.5 hours and had nearly nothing to eat or drink since I left at 5pm. Happy birthday Jackie! Are you going to start wearing power suits with your new motto? (a) Photos : I would have given up in despair when I see that crowd... but noooo you went "it's not so hard to find somebody in a crowd of 150,000". Good job! (b) Germany : Is Rheinkulture something like a Woodstock of Germany, but with more beer and less drugs? (c) Music : Calexico sounds pretty good. I know Wiki called it "alt-country", but "country" evokes pictures of Dolly Parton and Dixie Chicks, which they don't sound like at all. I can't think of a genre for them though. Eugene - I don't know about a dress code, but I've been musing that the motto for 30 or 31 will certainly need to be 'this time it's personal.' As for your so-called questions: a.) once I got oriented, I really never doubted I'd find them (and the news today is reporting the crowd at 200,000), b.) I suppose it's like Woodstock or Lollapalooza, but it's only one day and you don't need tickets, c.) some of their songs are more traditionally country and their myspace page calls them alternative/folk/country, which doesn't seem any more accurate, and d.) I found the lyrics to the song with English translation here. Hey Jackie, I like the new motto, but following it up with a post about music (unless music is your business) just doesn't work. Really your motto needs to be just business and blogging and stuff. 'All business' = a take-no-prisoners attitude towards every event that occurs in every passing day? That's what I thought. 29 sounds junky. I'm staying at 28. And props for finding people at the concert, which is totally impressive. As for music, I don't know that we have the same taste. How did you like Kontiki? Too pop-y for you? Do you have Neutral Milk Hotel? That might be more your style if the singer's voice doesn't grate on you. How did you like the LCD Soundsystem song I sent you? I'm not personally enamored with the album, but I can see why many people would be.